The fall/early winter season brings another delicious recipe with sausages: Bratwurst White Bean Stew. Your guests will like this dish for sure. It is easy to make and can be served with fresh bread or mashed or boiled potatoes. 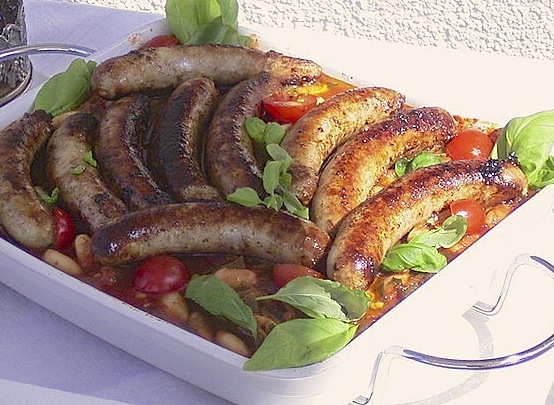 Following sausages are recommended for this German dish: Nuremberg Sausage, Rostbratwurst, Hofbrau Brats from Trader Joes, German Brats, Weisswurst or any bratwurst that is not heavily spiced. Aldi has some good ones and of course: Find authentic sausages on BavariaSausage.com - Happy Cooking! - Wash and prepare green beans, cut long ones one time in half. - Drain white beans from can and rinse them under running water. - Boil green beans until al dente (water with some salt). - Peel onions and chop finely, saute them in olive oil until transparent. - Drain tomatoes, keep the juice, chip them roughly and add to onions. Then add the juice. - Add garlic (squeeze it through a garlic press), beans, salt and pepper. - Cover the skillet and let cook for 30 minutes on low heat. - Shortly before the cooking time ends add chopped basil, keep some leaves. - In a separate pan fry the sausages until they are light brown and show a nice, crunchy crust. - Then place them on top of the bean stew and decorate with basil leaves.